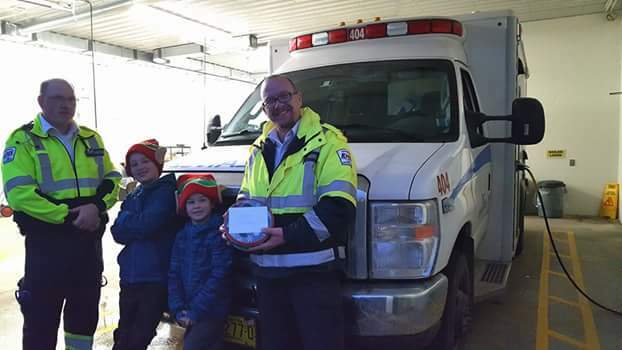 Today’s Random Act of Kindness was to bake cookies and deliver them to the RCMP (police) station, the paramedics and firefighters. I made 72 oatmeal chocolate chip. They’re a household favorite. Perhaps I’ll share my recipe. After the boys got home from school, Crash did his math homework and then we delivered said cookies. 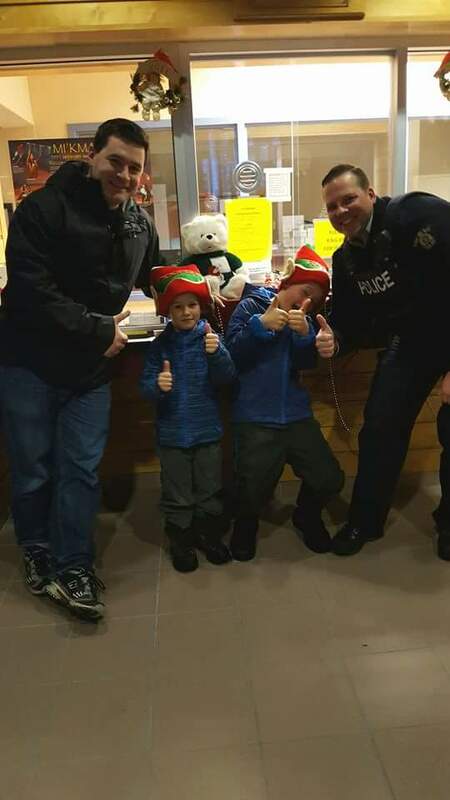 At the police station we met 2 very nice officers who thanked us and allowed the boys to get some pictures with them. Then they showed them the rest of the station, including the jail cells. I let the boys know should an officer ever call me and tell me they are in there, I’ll be leaving them there until morning. Of course, the boys had a million questions and one officer gave us his business card so the boys could email him if they thought of any more. Then we hopped over to the EHS (emergency health services) and delivered cookies to the paramedics. Again, the boys were thanked and allowed a photo op with a couple of medics in front of the ambulance. One paramedic took their picture to be put on the EHS’s Facebook page! Then they were invited inside and given a coloring book, reflective slap bracelet, and a color changing pencil. From there we skipped over to the fire station, but being a volunteer station there wasn’t anyone around. So we’ll have to try them again. While the cookies were baking this afternoon, I managed to decorate outside. It’s not much, but Santa shouldn’t have trouble seeing our place as he flies overhead. Merry Christmas. Thank you for all you do! This entry was posted in Uncategorized and tagged Advent, Children, Christmas, Decorations, kids, Kindness, Lights, Parenting, Parents, Random Act of Kindness, Thank You by stomperdad. Bookmark the permalink. Chocolate chip oatmeal are my favorites too. I have a post about them somewhere. Do you use the recipe on the oatmeal box? Great idea to visit your emergency responders. I don’t use the recipe on the box. I have my own 🙂 I love how soft and chewy they are. Regular chocolate chip cookies can be crunchy. The first responders were definitely impressed. Especially when they found out were just a family doing this on our own and not with a group like Cub Scouts or something. Glad they were receptive. Good experience for the kids. Thank you so much! The first responders were certainly appreciative of the cookies. I think it really made an impression on the boys to see how thankful they were. Or at least hope they were impressed. Very nice! The first responders really appreciate it ! Merry cwistmuest and thank you for all that you do too, Eric! We’re busy, but pleasantly busy. I’ll share the recipe. Saturday 🙂 Merry Christmas to you! Vrolijk Kerstfeest!